After an excellent trip to K2 Base Camp last year, I wanted something just as adventurous this time around as well. I grew up in the plains of Hyderabad, Sindh. Often travelling to and from Karachi, I would notice the mountains near Thano Bola Khan with wonder and excitement. How would these mountains look up close? What lies above them? What lies beyond them? These questions often intrigued me as a child. My first encounter with mountains occurred when I visited Islamabad for a conference in the third year of my engineering programme. I was struck by the beauty of the Margalla Hills and wanted to move to Islamabad. The dream came true when I found employment in the federal capital in 2003 after I completed my engineering degree. This allowed me an opportunity to explore the various trails in the Margalla Hills, and whenever work permitted, to go up north for trekking. I now live and work in Saudi Arabia and do not have the luxury of driving to the trailhead after work on weekends. To quench my thirst, I plan one long trip a year into the mountains. 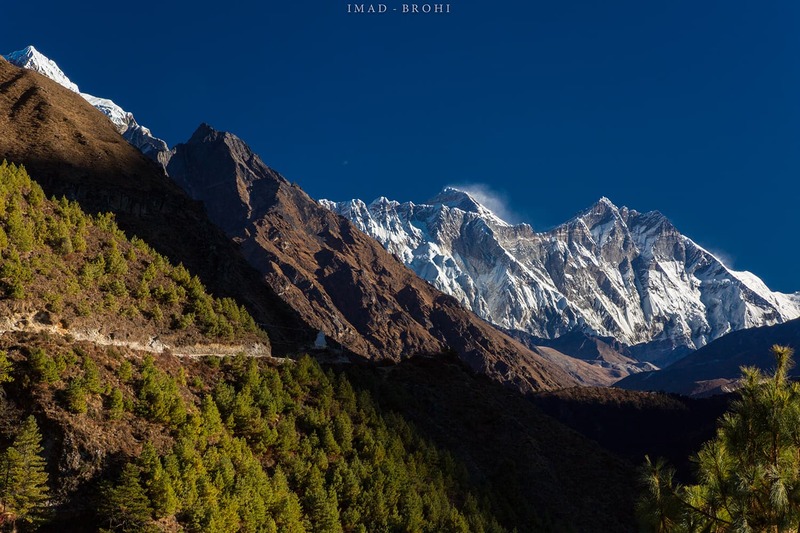 Panoramic view from Kala Pathar. Trekkers arrive in the afternoon to view Mt. Everest. Milestones left to right: Khumbutse (6,636m), Changtse (7,543m, in Tibet), Lho Laa (6,006m), Khumbu Icefall, Everest (8,848m), Nuptse (7,861m), Nuptse Icefall and Ama Dablam (6,812m). Because of work commitments, I could only go on a trip in November, but most of the mountains in the northern hemisphere are inaccessible at that time due to the weather. Luckily, however, the Mount Everest Base Camp trek was still open. The weather is cold in the Himalayas at this time of the year but the skies are clear. I didn’t know anyone who had been to Everest Base Camp before, so I started searching for trip planners online. 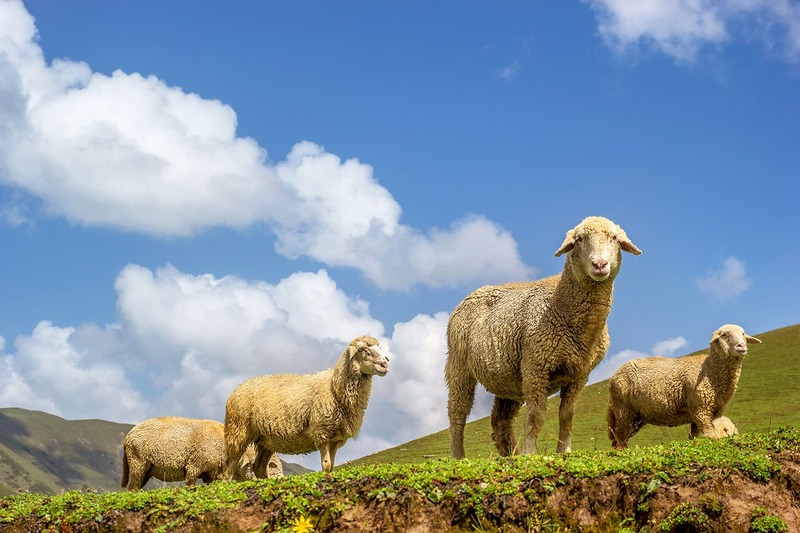 Many local and international trekking companies offer this trek with fixed departure dates and itineraries where one can sign up and join a group. Once with a company, all you have to do is show up at Kathmandu airport. 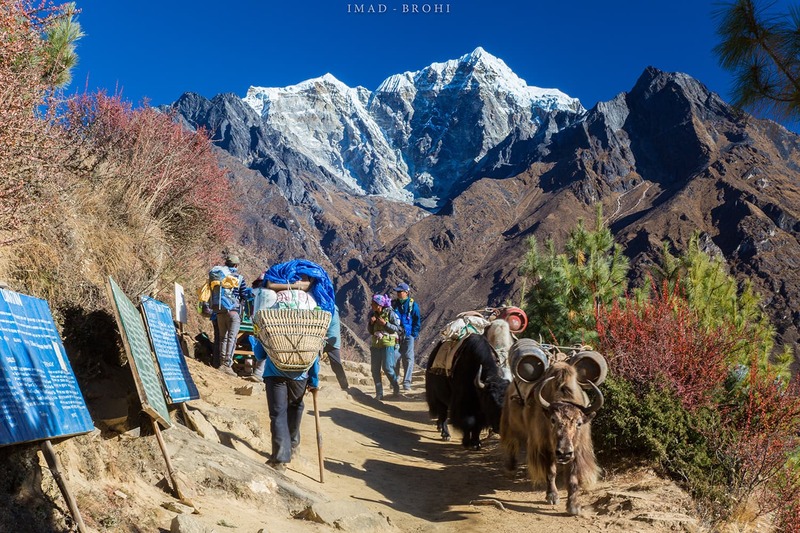 The trekking company is responsible for all the arrangements; that includes flights to and from Lukla, lodging in Kathmandu and on the trail, food, etc. The trek cost also varies from $800 to $2000 depending on the company and the services. Some popular operators are Himalayan Wonders and Ian Taylor Trekking. After discussing my trip with a few tour operators, I signed up with Himalayan Ecstasy, a local operator based out of Nepal. 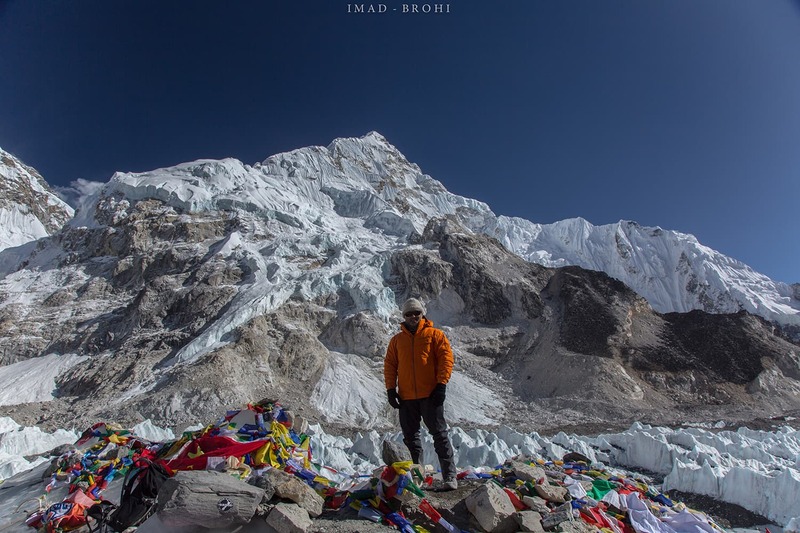 It’s a small company run by Anil Bhattarai, a two-time Everest summiteer who now manages the company and guides only summit climbs. He was very thorough in answering all my questions and in him I found someone who could help me progress from trekking to climbing in the future. If you are already in Kathmandu then you can hire a guide for a much cheaper cost. Solo trekking with no guide is the cheapest option, but then you will have to manage all the logistics on the trek. After climbs of Kilimanjaro and K2 Base Camp, I already had most of the trekking gear that I needed for this trek. My gear includes a couple of base layers (long-sleeved, breathable shirts), hiking pants, a mid layer (fleece jacket), rain jacket and pants, hard shell jacket and pants (for summit), a warm beanie, lining gloves and hard outer gloves, some hiking socks, sturdy hiking boots, hiking poles, a backpack to carry water and other items needed on the trek, and a big duffel bag which would carry everything else. I also carried with me medicines that I would need in case I fell ill. These included medications for altitude sickness, fever, allergies, diarrhea, cold and cough, nausea and vomiting, and pain killers. When heading into the mountains, hope for the best but prepare for the worst. To truly enjoy the experience, one must be fit enough to trek up to 10km or more a day at high altitudes. While on the trail, I saw many people who were struggling with altitude sickness and breathing problems. Most of us live at lower altitudes and will struggle at higher altitudes due to lower levels of oxygen. Regular workouts at the gym, running, and bicycling are good ways to train for this adventure. A month before the trip, I was weight training in the morning and biking 20km or more in the evening for cardio training. Even then, the lack of oxygen at higher altitudes can make the climb difficult. Ready to take on the challenge, a month later, one early morning in November, I embarked on yet another thrill-seeking adventure, flying from Dammam and landing in Kathmandu. Trekkers usually spend a day in Kathmandu before heading to the Everest trek, but I didn’t waste any time and had my connecting flight to Lukla scheduled for the same day. Day 1: Flying to Lukla over the Himalayas. 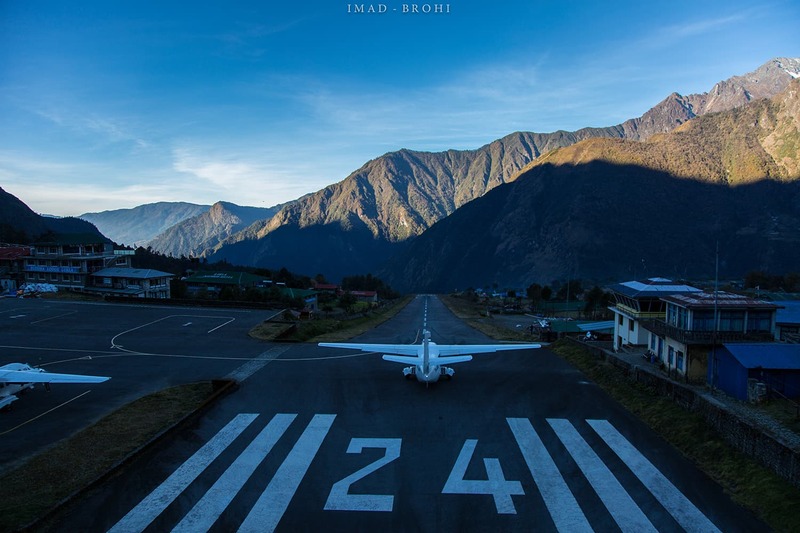 Regarded as one of the most dangerous airports in the world, due to the height it's located at (nearly 9,500ft) and the shockingly small runway (1,729ft), the stunning 45-minute flight to Lukla is an adventure in itself. The scenery from the plane window is unbelievably dramatic. 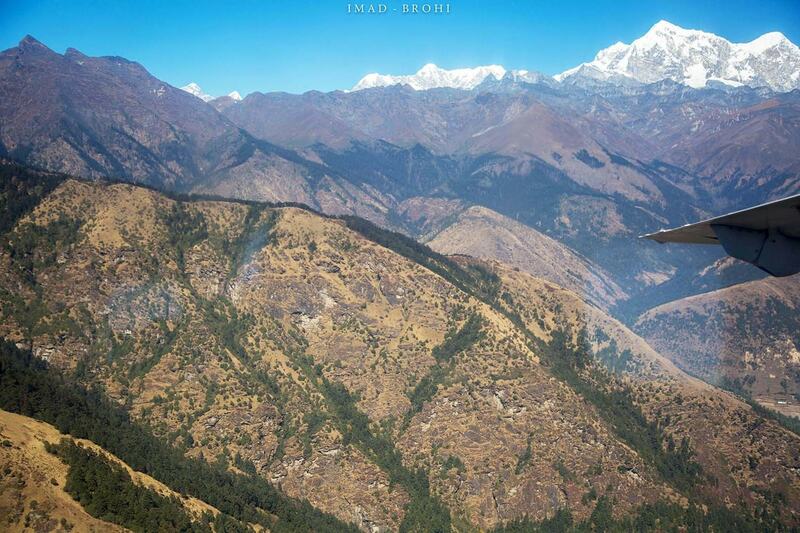 The plane flies over Himalayan foothills so closely that the hilltops seem to be almost touching the plane. Shortly after, there are mountains much higher than the plane’s altitude. By then, the plane has almost arrived in Lukla; there is a sharp descent onto the runway, sloped steeply to assist in slowing the plane to a stop before it hits the mountain wall at the other end of the runway. Outside the airport, I met Manoj, my humble, soft-spoken Nepalese guide who would take me all the way to the base camp and back. Day 1: A lodge mess in Lukla. 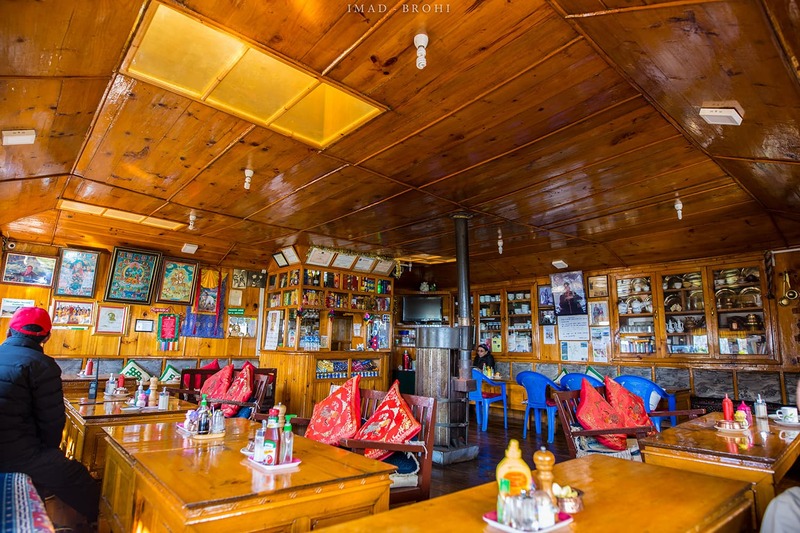 Most trekkers fly in to Lukla and hike to Phakding on the same day, but I had done enough travelling for one day, so we decided to get some rest and settled into a lodge in Lukla. 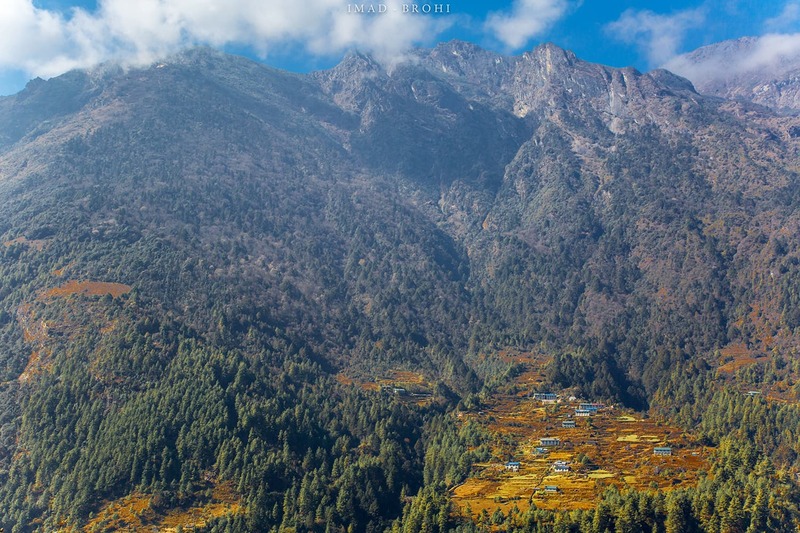 At an elevation of 2,750m, Lukla is the starting point to Everest and many other mountains. It’s a small community with lodges, cafes and shops containing trekking supplies. We got on the trail fairly early next morning. 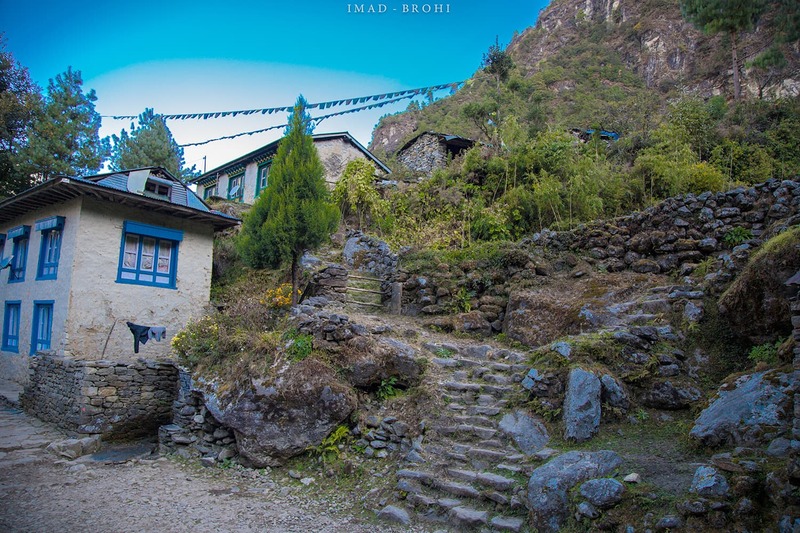 After a few hours on the path, which passed through several small villages and mountain communities that looked like something out of a fairy tale, we arrived in Phakding. Phakding is usually the destination on day one for most trekkers, but we pushed further until we reached a small mountain community called Monjo, which is about 5km away from Phakding. 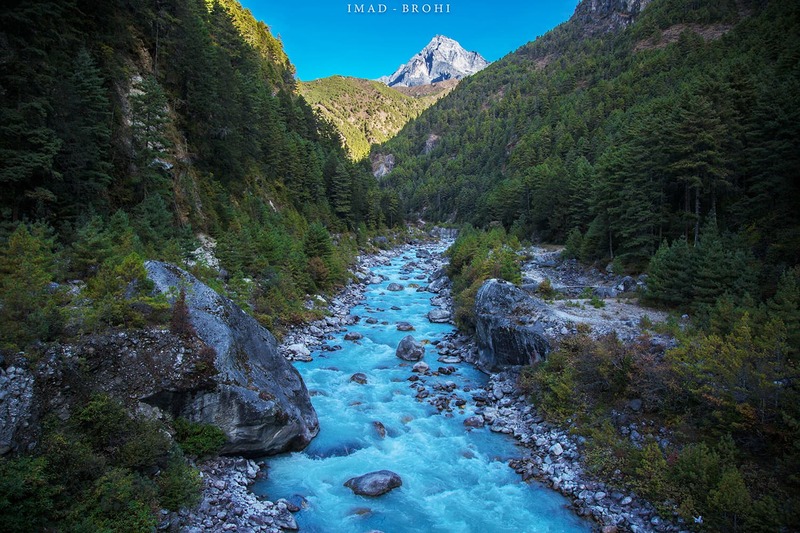 It lies just at the door of Sagarmatha National Park, the home of the Himalayas. At this point we had ascended 100m over Lukla. Day 2: Looking over the valley while walking out of Lukla. Day 2: Walking through one of the villages enroute to Monjo. Day 2: Night falls in Monjo. As usual, we started early the next morning for our next destination, Namche Bazar. 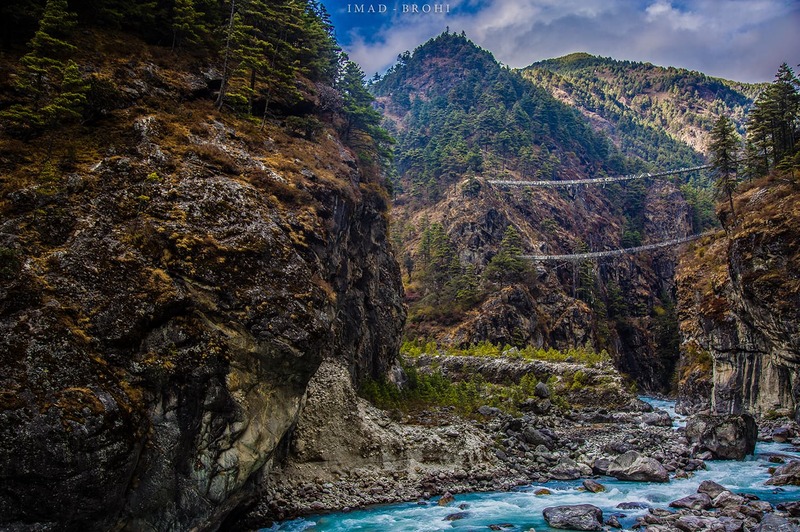 Much of the 6km trek stays at the banks of the Dudh Koshi River--also known as the Milk Koshi River-- with a few crossings on the famous suspension bridges of Nepal. 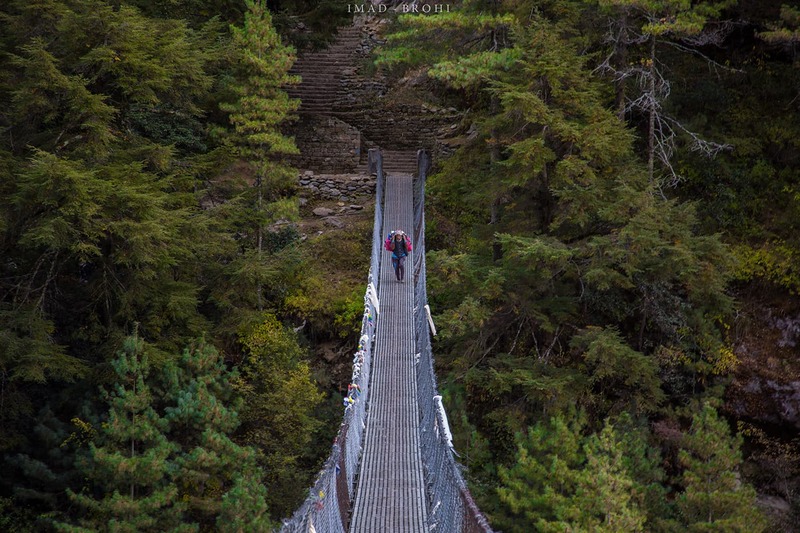 Although intimidating for some, I actually enjoyed walking on the suspension bridges. They are pretty sturdy at the ends but sway at the centre. Just before Namche Bazar, there is a steep ascent in switchbacks that reminded me of Trail 3 in the Margalla Hills in Islamabad. We kept moving until the slopes opened up to a beautiful community with colourful dwellings built on the slopes of a hill. 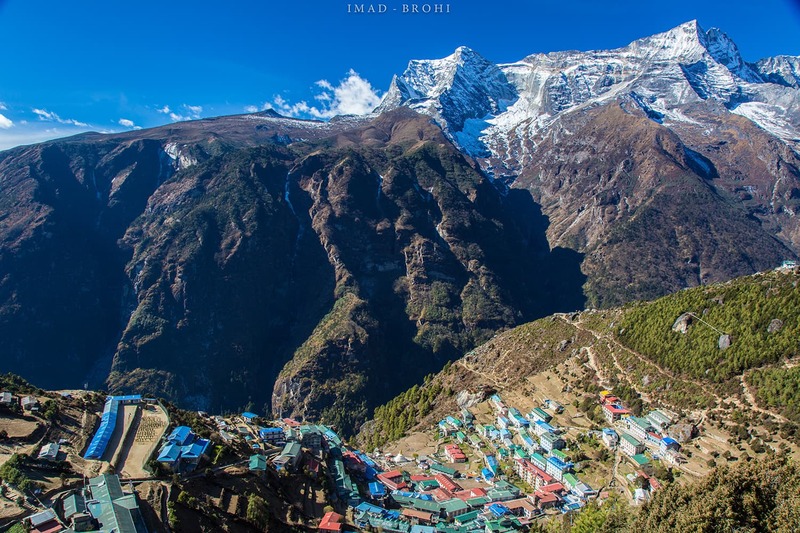 “Welcome to Namche Bazar,” my guide said to me. We had arrived rather early and had set aside the following day to rest and acclimatise, so we went out in the evening to explore the village. Namche is like Lukla but on a larger scale. We found lots of tourists, cafes, and lodges scattered around thin lanes going up and down the slopes. The place is to trekkers and climbers what a candy store is to kids. You can find any trekking or climbing gear in Namche Bazar of both local and imported brands. 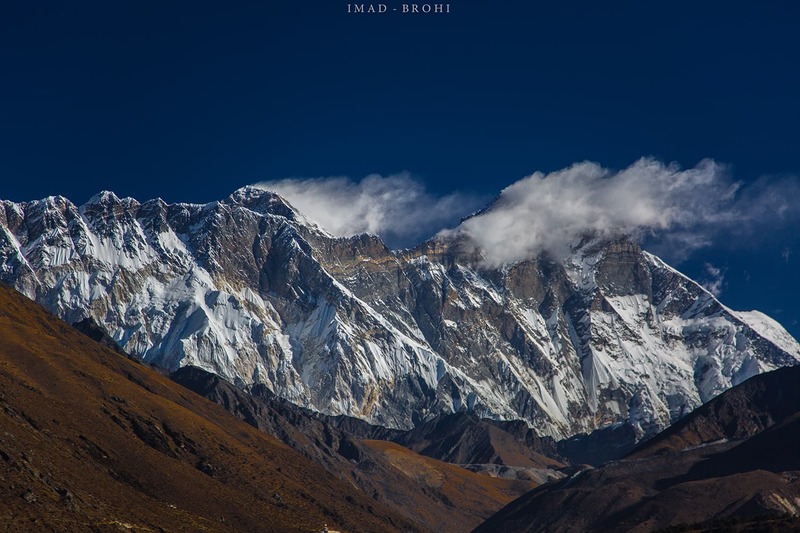 Day 3: Trek along Dudh Koshi towards Namche Bazar. Day 3: Suspension bridges along the trek. Day 3: A porter carries supplies across the bridge. 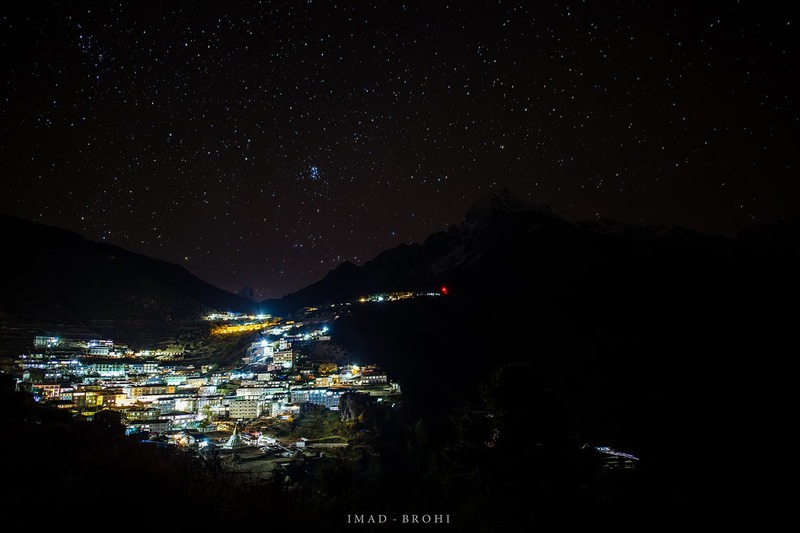 Day 3: Night falls on Namche Bazar. 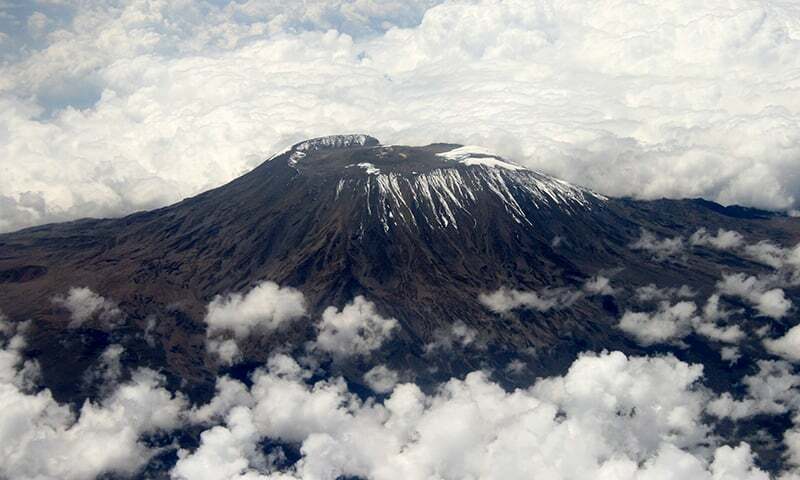 It is always a good idea to climb higher and return to the same altitude for proper acclimatisation. For us, it was a nice two to three-hour hike from 3,450m to the viewpoint at 3,850m. The trail was steep and hardly offered any new views except when we looked back to see Namche Bazar and the beautiful Kongde Ri peak (6,187m). The view from the top of the viewpoint is magical. 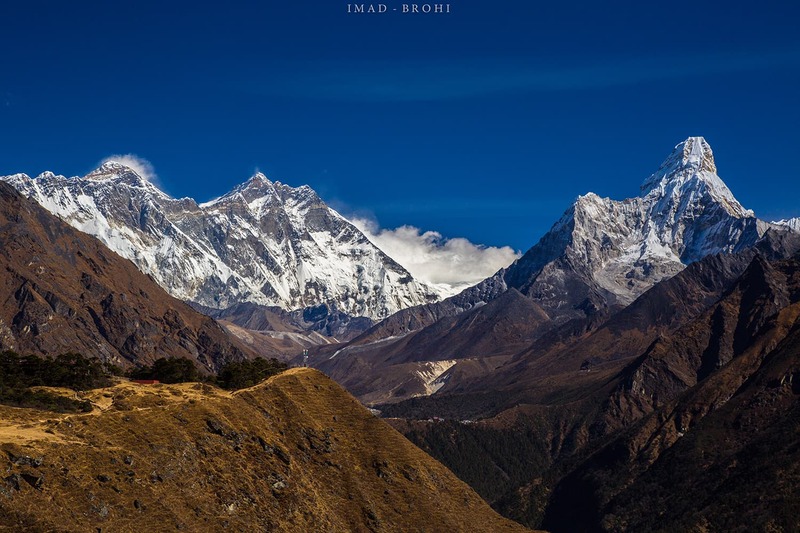 For the first time we noticed the other side of the valley that is home to the beautiful 6,812m-high mountain, Ama Dablam (which means Mother’s necklace), and the Everest massif that includes Everest (8,848m), Nuptse (7,861m) and Lhotse (fourth-highest mountain in the world at 8,516m). Also visible was Tengboche, our next stop. We stayed up there for a few photographs and then returned to Namche for lunch. Day 4: View of Namche Bazar from the top with Kongde Ri (6,187m) in the background. Day 4: First views of Everest (8,848m), Nuptse (7,861m), Lhotse (8,516m), Ama Dablam (6,812m) and Tengboche (3,900m). 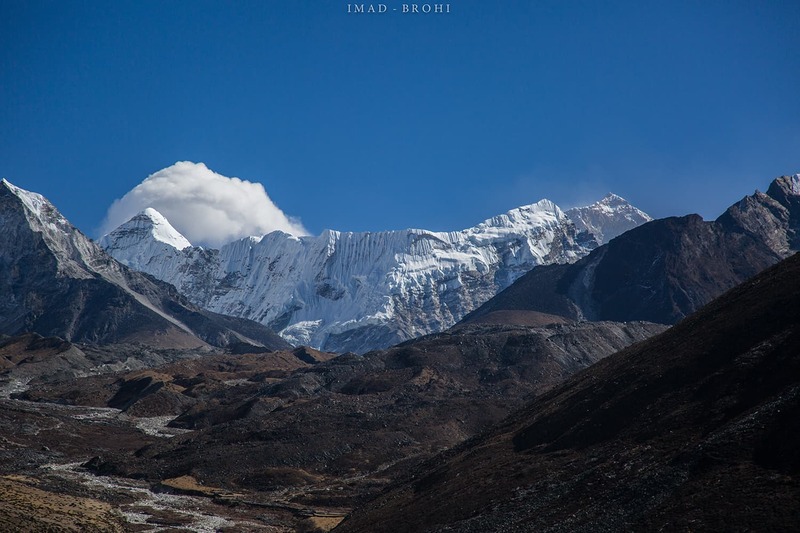 The trek from Namche to Tengboche is tough and about nine kilometres long. The path gains 200m of elevation from 3,450m to 3,650m after which the trail becomes flat. After a good three to four kilometres, the trail descends sharply to Phungi Thanga at 3,200m. We stopped and had lunch just by the Dudh Koshi river. Afterwards, we crossed the river on a bridge and then climbed from 3,200m to Tengboche at 3,900m. It’s a tough and steep ascent mostly via switchbacks on a well-maintained trail. But all the hard work paid off when we reached our destination. The camp is located on a hill and houses one of the most sacred Buddhist monasteries outside of Tibet. 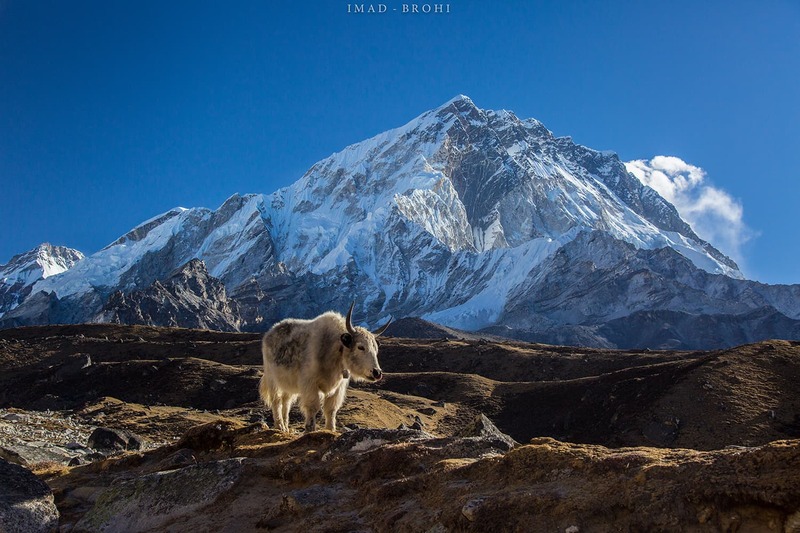 Horses and yaks were grazing on the hill and Ama Dablam, Everest, Nuptse and Lhotse were magnificent and imposing in the background. I went out to the hill several times to take pictures--at sunset, in the dark to photograph stars, and early in the morning to capture the sunrise. Every time there was something new to look at. 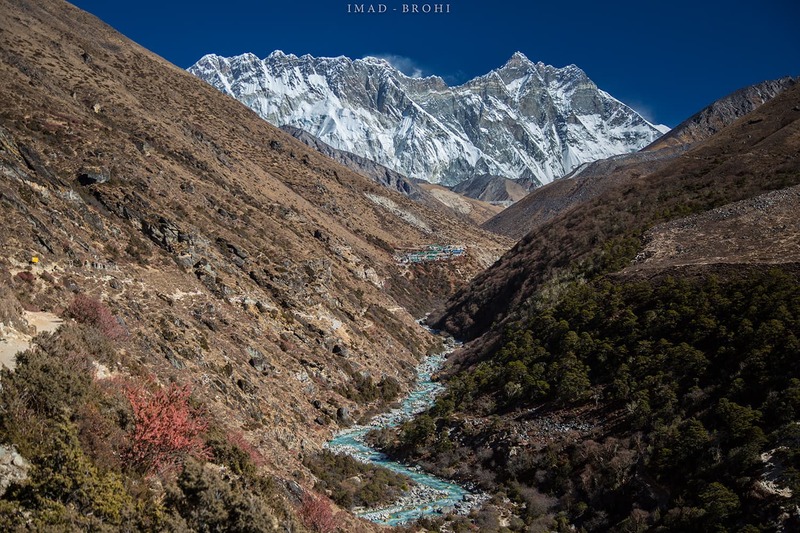 Day 5: The trail towards Dingboche. Day 5: Yaks carry heavy supplies between camps with Taboche (6,495m) in the background. Day 5: The beautiful village of Tengboche. Day 5: Night falls over Tengboche. The lights on Ama Dablam are of climbers attempting to summit. 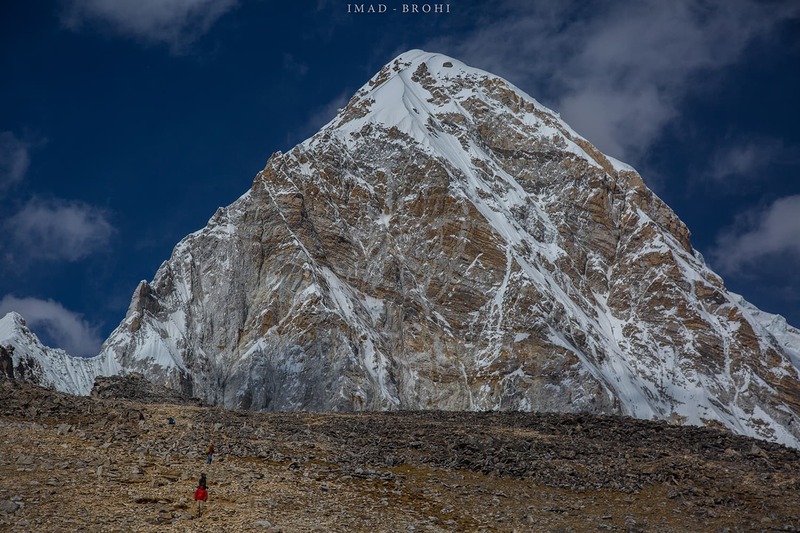 The route to Dingboche, our next goal, was rather simple and did not offer much challenge. First the trek descends from Tengboche to Diboche and from then on there is a gradual ascent on a good trail. We then crossed the Imja Khola river on another suspension bridge and from there on we stayed on the left of the river valley. 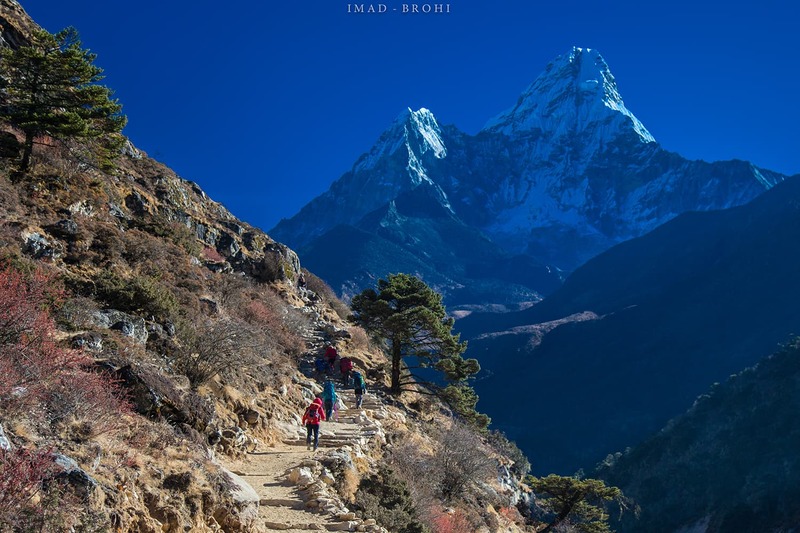 The route holds beautiful views of Ama Dablam and several stupas. 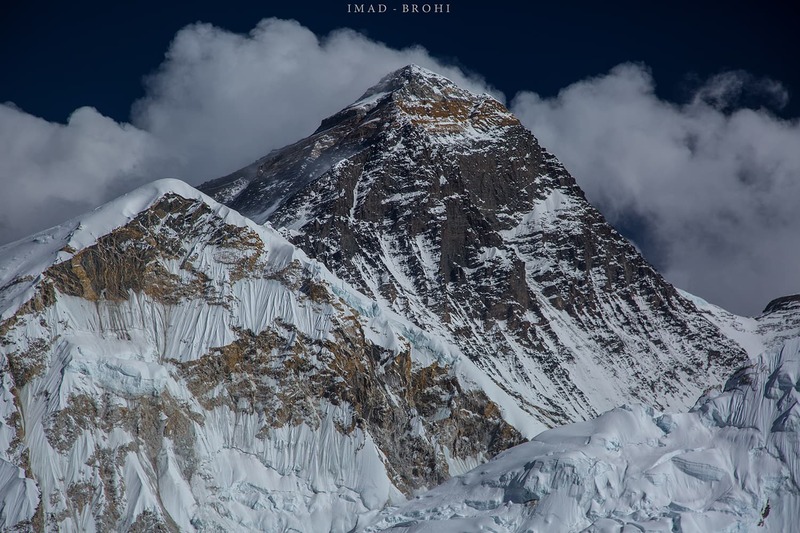 As we moved forward and got closer to Nuptse, we slowly lost sight of Everest’s peak. 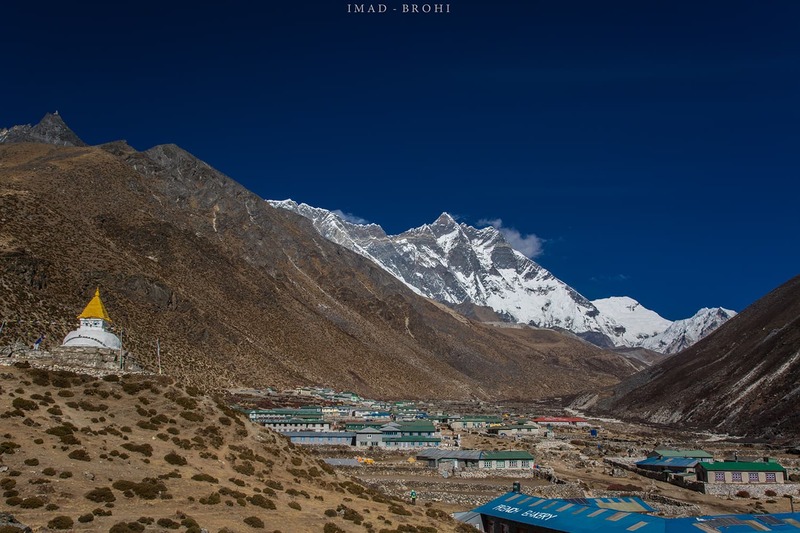 The campsite of Dingboche could be seen from a distance, a stupa on guard, and mighty Lhotse in the back drop. 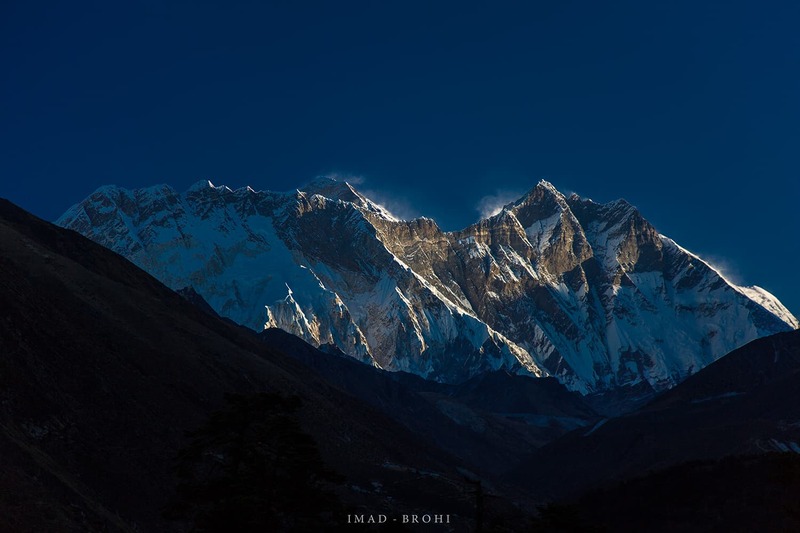 Day 6: First light on Everest massif. 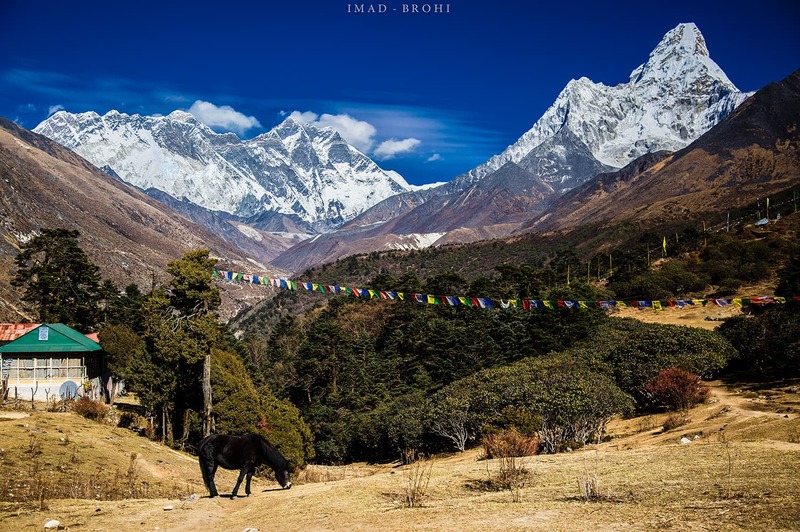 Day 6: Trail to Dingboche with Ama Dablam (6,812m) in the background. 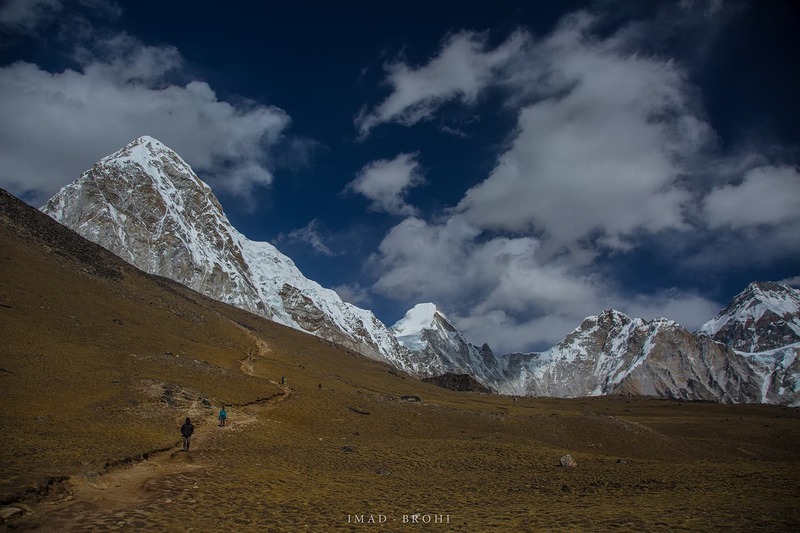 Day 6: The trail and community of Pangboche enroute to Dingboche. Day 6: Arrival at Dingboche. 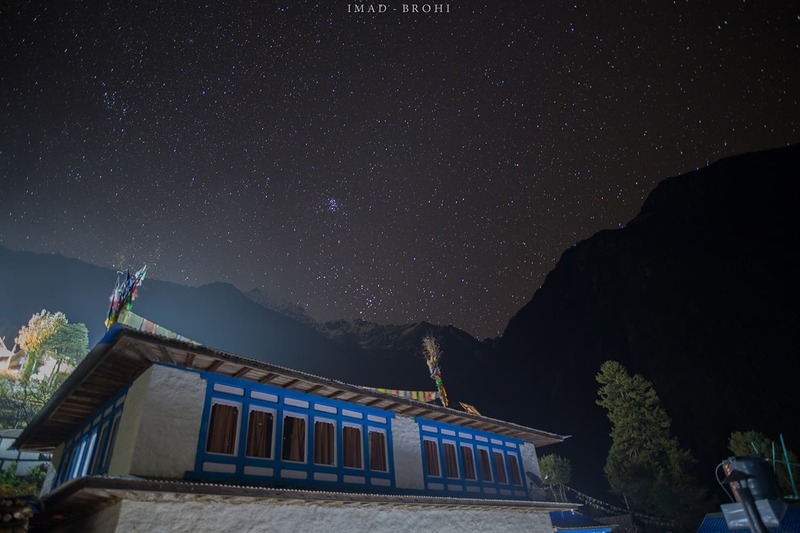 A stupa stands on guard with lodges in the community and Lhotse in the back drop. 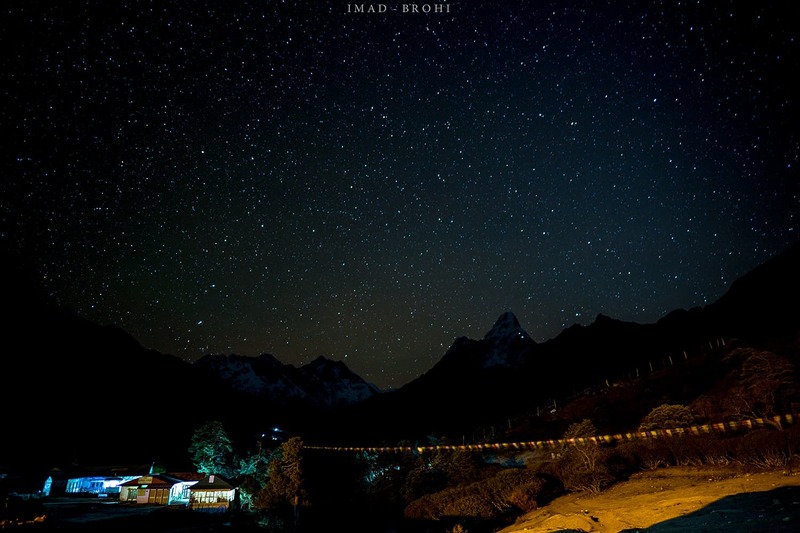 Day 6: The Milky Way as seen from Dingboche. At Dingboche, we had a rest day. We used it for acclimatisation by climbing higher, to 5,080m, from Dingboche’s elevation of 4,400m. The acclimatisation hike was extremely fruitful as we enjoyed views that are otherwise not seen on this trek. 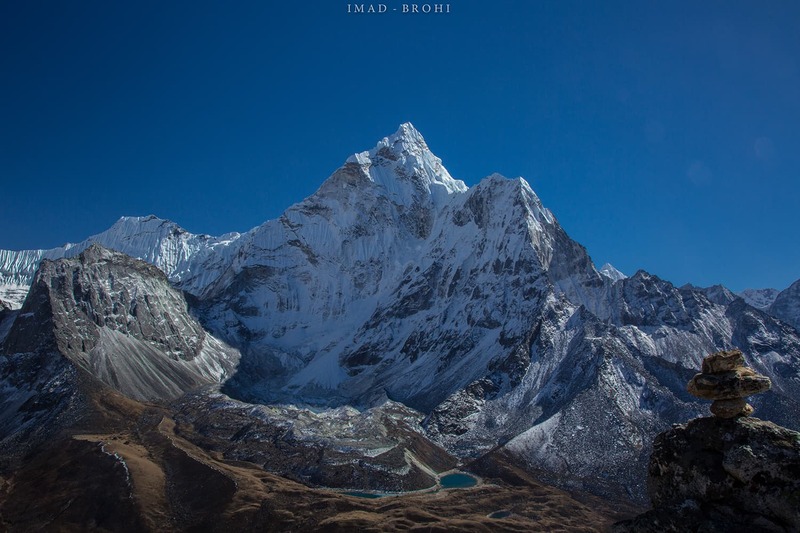 The hike offers views of the 6,189m-high Island Peak, the north face of Ama Dablam, and even Makalu, the fifth-highest mountain in the world at 8,481m. After some quick photography and snacks at 5,000m, we made our way back to the campsite. Day 7: Acclimatisation hike to 5,080m with Taboche, Cholatse and Arakam Tse peaks in the background. Day 7: View of Island Peak (6,190m) and the world’s fifth-highest mountain Makalu (8,480m) from the top of acclimatisation hike. Day 7: Ama Dablam’s north face from the top of acclimatisation hike. 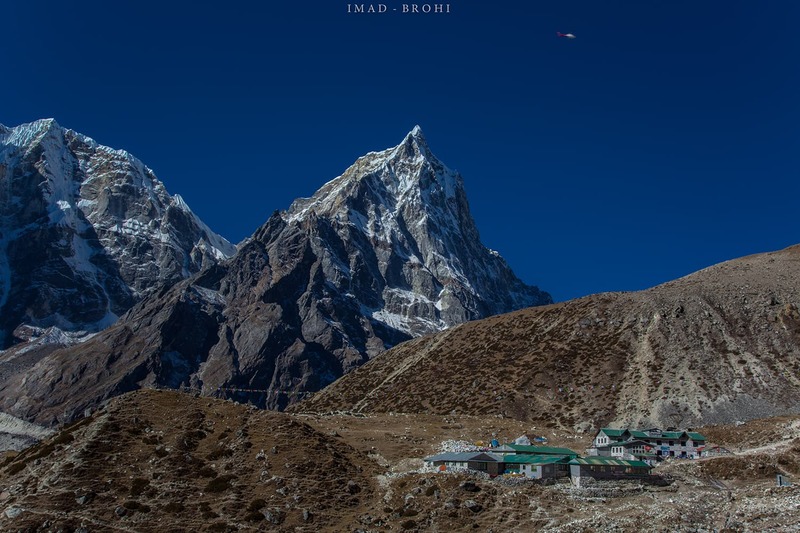 The distance from Dingboche to Lobuche is about 10.7 kilometres. Except for one steep section, the route is rather gradual and very enjoyable. We climbed a hill to go east initially and then continued our march to the north. There is a stream which we crossed on a short bridge to arrive in Thokla, a community built on the foot of Cholatse (6,423m). There is a steep section after Thokla, rising 200m before flattening at the top where there are memorials for those who perished while climbing in the Himalayas and other mountain ranges. After that the ascent is gradual with excellent views of Pumori (7,161m), Lingtren and the mighty Nuptse (7,861m). The Lobuche camp site lies opposite the majestic Nuptse wall. Day 8: The community of Thokla (4,600m) with Cholatse (6,440m) in the background. 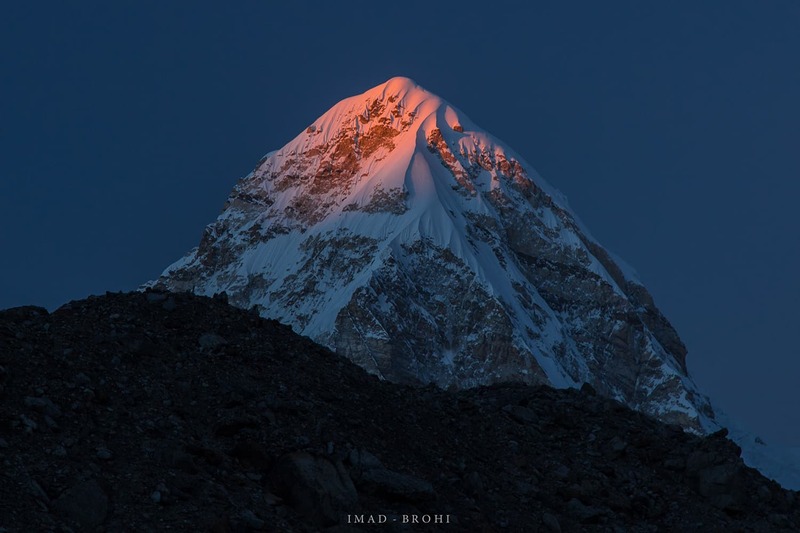 Day 8: Last light on Pumori (7,161m) from Lobuche Camp (4,900m). Day 8: Night falls on Lobuche Camp (4,900m). 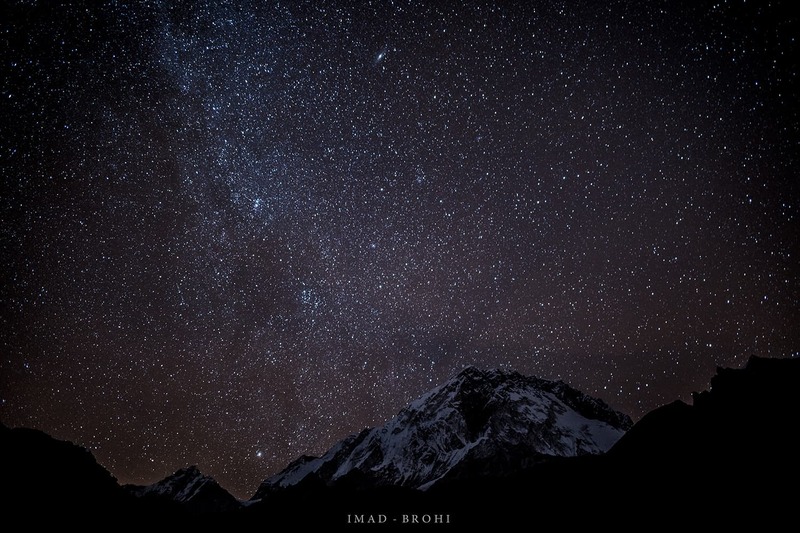 Stars and the galaxy of Andromeda light up the sky over Nuptse (7,861m). We are now too close to Nuptse which is blocking our view of Mount Everest. 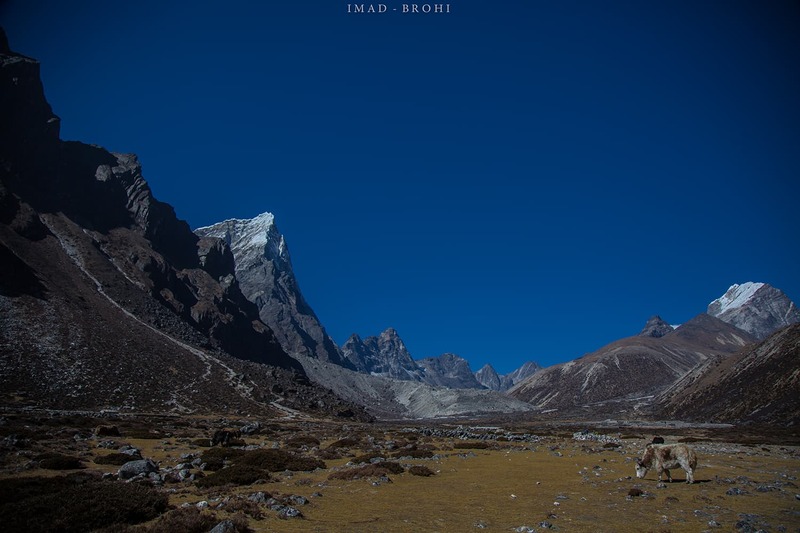 The 12km track from Lobuche to Gorakshep is gentle until the Lobuche pass, after which there are multiple ups and downs. 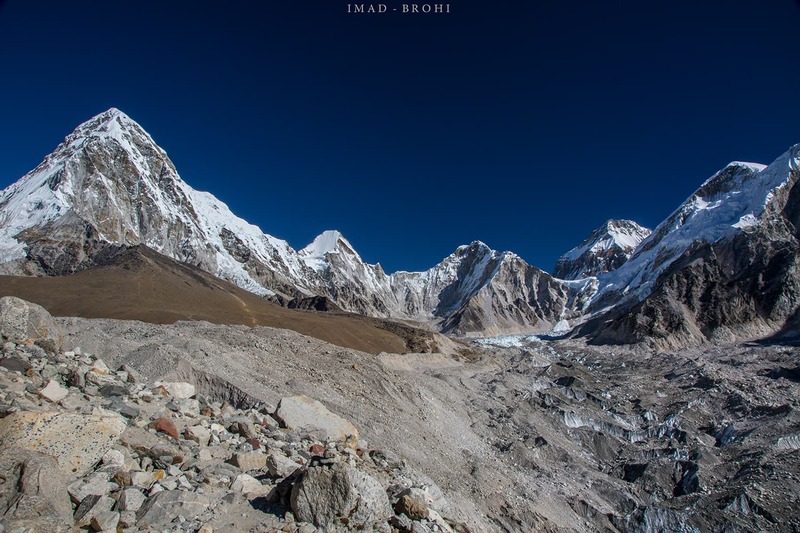 Once at the top of the pass you can see the Khumbu Glacier and even the Khumbu Icefall. It took us three hours to reach Gorakshep where we had lunch and continued our march to Everest Base Camp. The path to the base camp is similar with multiple ups and downs and crossings, but the trail becomes gradual again as it nears the end. After some point, the base camp is visible from the trail, but you have to go down on the glacier to access it. Since November is not an ideal time for climbing, the trip to the base camp was even more of a milestone. After a few pictures at the base camp, we were on the trail back to spend the night in Gorakshep. Day 9: A yak grazes in the morning as we trek to Gorakshep (5,165m). Day 9: First view of Khumbu Glacier from top of the pass. Day 9: People gather at Mount Everest Base Camp along the side of Khumbu Glacier. 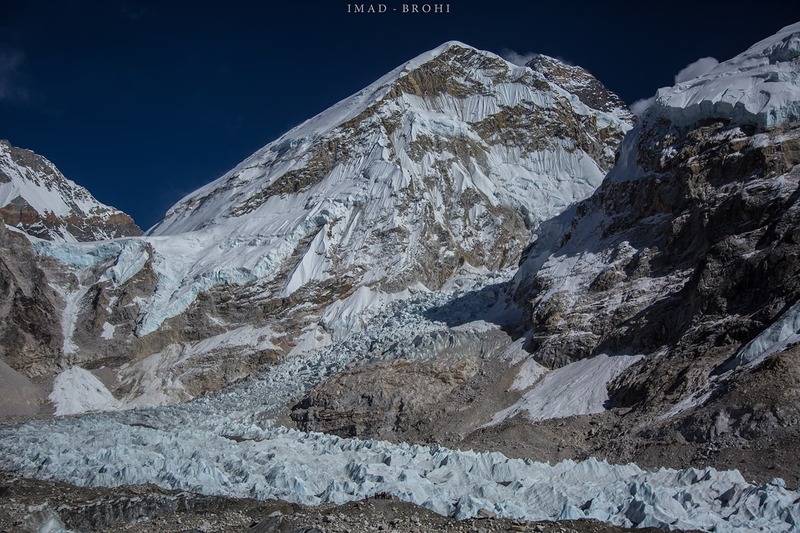 The glacier between Lho La and Nuptse is the Khumbu Icefall, the first step and a daunting one for those climbing Mount Everest. Day 9: Mount Everest Base Camp at 5,265m. Day 9: Everest Base Camp at 5,265m. 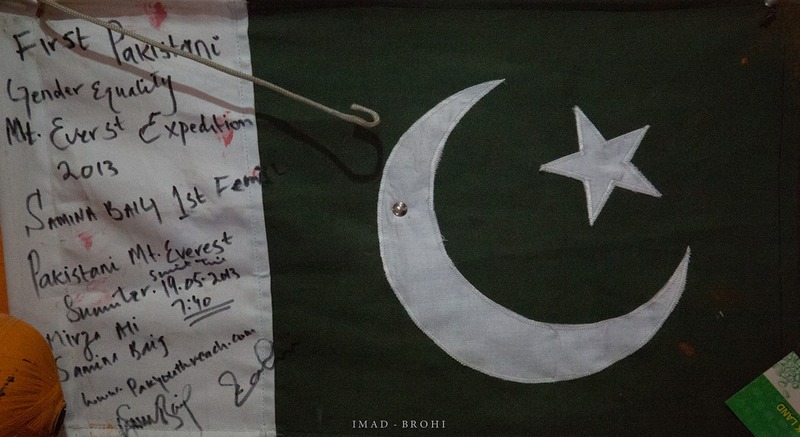 Day 9: Pakistani flag at the lodge in Gorakshep, signed by 2013 Pakistani Everest Expedition Team including Samina Baig, the first Pakistani woman to summit Everest. Before I go further in my journey, it is important to understand how the Everest massif came to be. The Himalayas were created because of a collision between the north-moving Indian plate and the Eurasian plate some 40 to 50 million years ago. Presently, the Indian plate continues its movement into the Asian plate causing the Himalayas to rise about a centimetre each year. 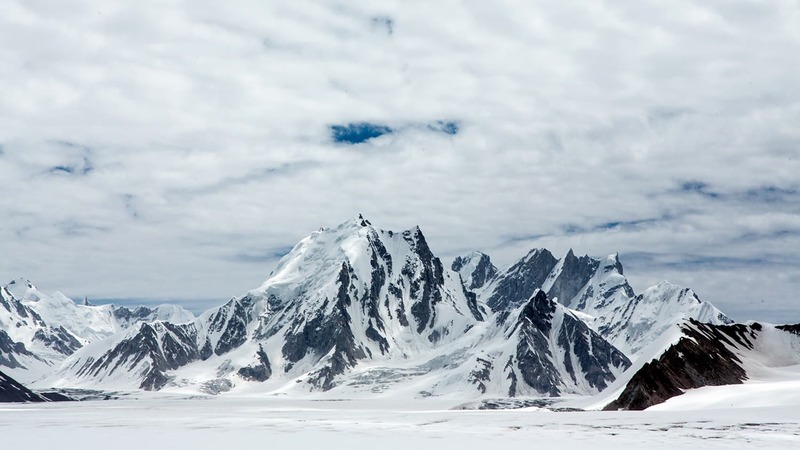 Unlike K2, which is a pyramid-like mountain standing by itself, the Everest massif is a group of mountains and peaks that are connected to each other via ridges. The three mountains in the Everest massif are Everest, Lhotse and Nuptse. Everest (8,848m) is connected to the world’s fourth-highest mountain, Lhotse (8,516m), and to Nuptse (7,861m). Together, they form a U-shaped structure with the top facing north-west. At the top of this “U” is the Khumbi Icefall, the first step for those climbing Everest. In between the U-shaped valley is a low basin called Western Cwm where climbers usually set Camp 1 and Camp 2. Approaching the mountain from Nepal, the trek remains south of the massif and the Nuptse wall is always between us and the peak of Everest. From far-off camps, Everest’s peak is seen sitting behind Nuptse, but from Lobuche onwards, as we get closer to Nuptse, the Everest peak gets blocked by Nuptse and is no longer visible. 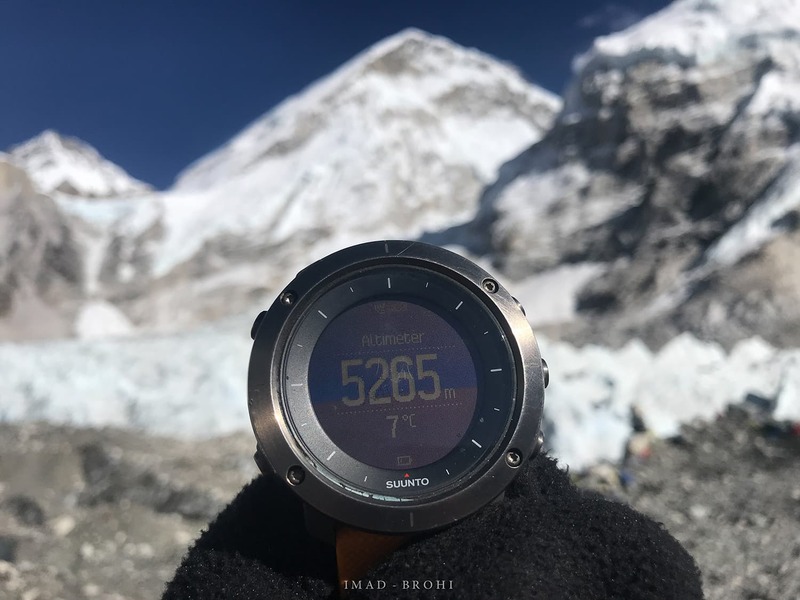 To have a good view of Everest, one must climb Kala Pathar (5,650m), which is not technically a mountain but rather a ridge on Pumori (7,161m). Before Sir Edmund Hillary and Tenzing Sherpa conquered Everest in 1953, it was thought to be impossible to climb. Two years before their successful summit bid, Sir Edmund Hillary climbed Pumori just to have a closer look at Everest and find the climbing route to its summit. Mick Conferey in his book Everest 1953 describes the events of the expedition in great detail. The U-shaped Everest massif (image taken from Google Maps, click to enlarge). Different groups climb Kala Pathar based on their plan and convenience. While some trekkers climb in the dark to view the sunrise on Everest, others climb in the afternoon to view the sunset. After breakfast in the morning, we packed a few sandwiches and went on our way to Kala Pathar. We started our ascent at 11:30am, climbing slowly with frequent breaks for water and pictures, and reached the summit (5,650m) at 2pm. Day 10: The trail to Kala Pathar (5,650m) from where we would get a clear view of Mount Everest. Day 10: Approaching the Kala Pathar (5,650m) summit with Pumori (7,160m) in the background. Day 10: Kala Pathar summit at 5,650m. 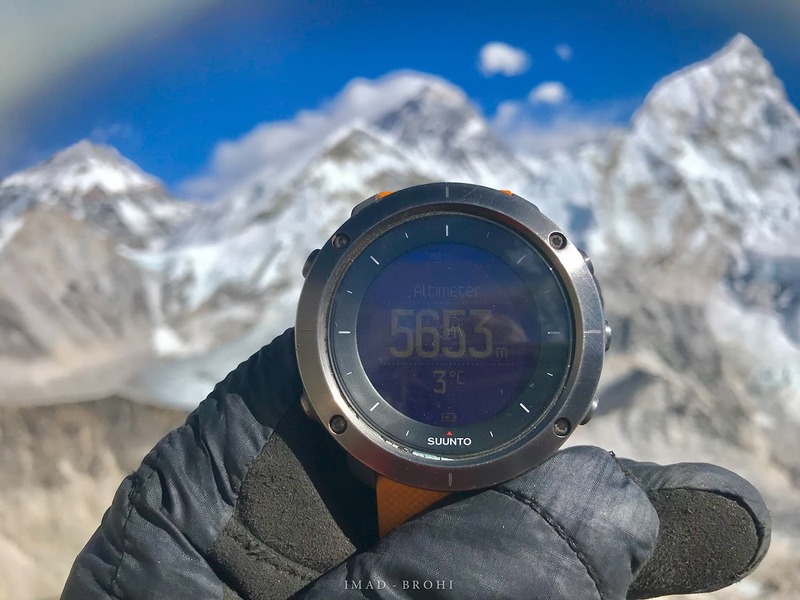 Day 10: Everest summit (8,848m) from Kala Pathar. The last 10 minutes of Kala Pathar required some minor scrambling but nothing too serious. Caution is advised though as there is a bit of exposure (high risk of injury due to the steepness of the terrain) at the top. Although we had planned to stay at the summit until sunset, the cold and heavy winds that afternoon forced us to return earlier. From where we stood, the Everest summit was clearly visible, lying between the Lho La and Nuptse. The return trip from Gorakshep to Lukla was rather uneventful, just as we wanted. The distance is almost 60km and we covered it in three days with stops in Pangboche and Namche Bazar. The total distance of the trek, from start to finish was 135km with a maximum elevation of 5,650m. Day 11: Looking back at the valley we came from. Day 12: Strong winds blow on Everest and Lhotse on a clear day. I know a few would be wondering how this trek compares to the K2-Concordia trek. 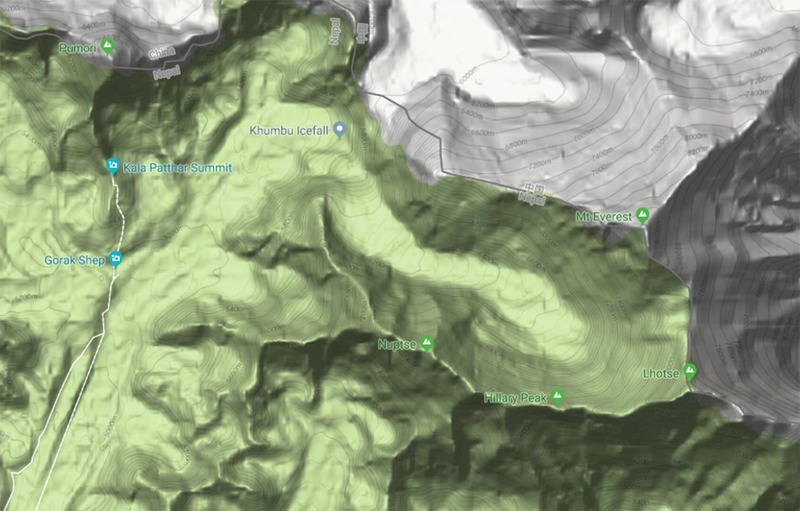 In terms of difficulty, I believe the Everest Base Camp trek--although a few hundred metres higher--is much easier, as there is a proper trail all along from Lukla to Gorakshep, whereas the K2-Concordia trek is more treacherous and stays on an uneven glacier for the most part. Add to this the fact that in Nepal, overnight accommodation is in tea houses with beds and that there are wifi and battery charging facilities. This becomes truly a five-star trekking experience. Although I personally prefer overnight camping in tents, which we did on the K2-Concordia trek, a number of people would prefer the luxury of a proper bed which is available in most places in Nepal. That still doesn’t mean that the Everest Base Camp trek is to be taken lightly by any means. Climbing to 5,650m requires good health and fitness. I must say, I truly enjoyed my two weeks in the beautiful Himalayas and look forward to going back again one day. Thano Bola Khan mountains ...every frequent traveler of Super Highway can relate to it. However, kudos to you that you have gone to far away, upto Everest. My OZ colleague said these are the best collection he has seen. He went to the base camp few months back. Excellent! Thanks for taking us into your journey with awe inspiring pictures and words. I trekked to the base camp and Kala Pathar as a teenager in the late 1980’s. This article brought back memories of awe inspiring sights. Kudos to the author for capturing it so well on camera and vividly describing the trek. I am in awe of your brilliance and how you have described everything with such fine details - Bravo Imad; I absolutely loved it. And thank you Dawn for this wonderful article. Wow, this is just amazing! Beautifully captured! Such a very well written article. . . . . Described the experience with such intricate details, you actually fall in love all over again. . . .. Thanks for sharing - Excellent. Keep it going and sharing to inspire others. Wow!I wish I could have there with him. Pictures are simply stunning. I find it so envious! A commendable job done by the adventurer. Breathtaking visuals! Wow! I find it so envious. A commendable work done by an Adventurer. Breathtaking visuals. Wow! Your trip to mountain and the way it has been presented by you for ‘Dawn News’ must have enticed many to follow suit. I have found your presentation of mountaineering trip very interesting. The paper has provided treasured details. This is a well-organized, well written, well-structured and nicely illustrated article. You have given the readers just enough information to whet their curiosities. Mesmerizing snaps that's run excitement and thrill within! Beautiful country. Amazing Stuff. Keep the spirit alive. I've always enjoyed your travelogues and liked learning about far away places through your experiences. You took absolutely beautiful snaps. I am looking forward to seeing you on the top of Everest I’A. Excellent, breathtaking, the only way people like me can see in awe the beauty and granger of God created Nature. Amazing pictures and a very well written article. Always dreamt of doing this trek, but never got around to. Your write-up has provided me with the much needed motivation. Thanks for sharing your experience. Excellent write up with fantastic pictures. Himalayas have a magnetism that pulls you in its grasp. Once you have seen then in all their glory you are hooked for life. More so if you are from the plains as the author and me from Kolkata. I wish our Indian print and online media learns something from Dawn and dedicates some space for such awe inspiring travellouges. Excellent pictures and the details of your inspiring expedition to the Everest. Good job Imad, keep it up. Amazing article and great pictures. Not to mention very well written article. You need to do more treks in Pakistan and then with your writing and photography skills, share them with the world and get people to come and visit these off beaten paths. Fantastic photography and excellent wriring! U R a pro man!I did this trek in 2013;Samina and her brother were at the base camp.We met them late when they came to US. A great piece. Lived in Hyderabad for 22 yrs. It’s nice that u has courage to see the beauty of Pakistan. Very very good. More power to you. Climb all the mountains. WOW, incredible! Which camera make you used? Remarkably stunning, heaven on earth. The photographer did an amazing job of capturing the scenes, I'm loss for words, the landscape and mountains are that beautiful. Our part of the world truly is heavenly. Thank you for sharing. You are our Hero!! Wow, stunning photogrophy and very well done! Incredible journey ...just do it, should be the motto for all. baffling Snaps ! kudos . . .
Beautiful pictures. Imad bhai I have made the one with the Yak If I am not wrong as my wallpaper. The article has been written brilliantly. Engineer style :) . Very happy for you. Best article I've read so far on travelling; great pics. & useful data. Stunning Adventure. Thank You For Sharing! Stunning Adventure, Thanks to you for sharing! Excellent narration and fantastic photography..... Very inspiring! 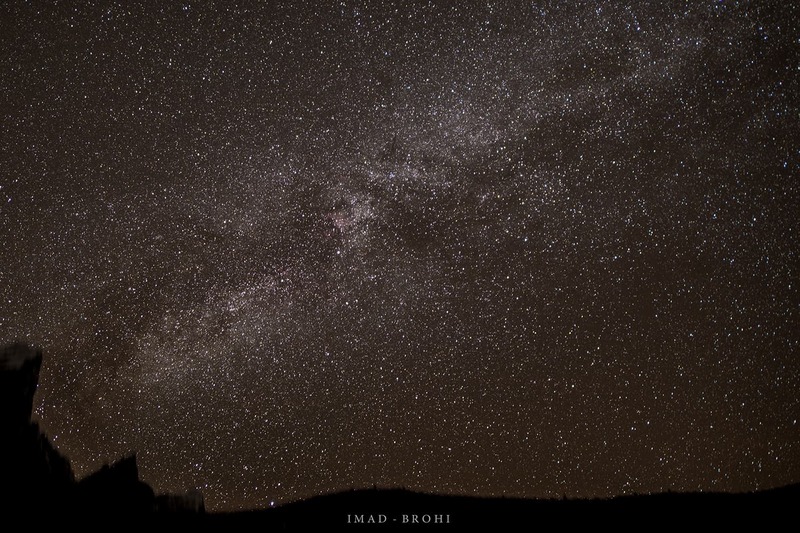 Awesome photos Imad. Reminded me of my trek to the EBC in 2011. Vivid and detailed description made the entire reading so enjoyable. Very nice. Keep it up Imad. I trekked to Everest Basecamp earlier this year without booking with any of these groups. I think Himalayan wonders and other groups like these. Mail me if anyone is interested in doing it. Great description with amazing pictures. Thank you for sharing. Nicely written. 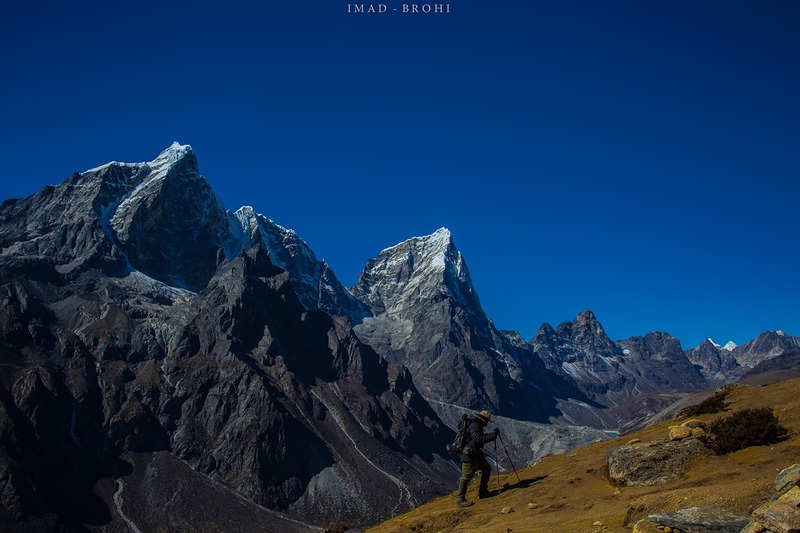 for every trekking lover this article will take you into journey with writer. the details of trekking you mentioned is tremendous. Excellent writing. Wow! Definition of the word “adventure!” Breathtaking photographs & you articulated your 13 day journey beautifully. Thank you for sharing, Imad. Great article with amazing pics! Absolutely superb! Imad has taken us along on an on fabulous trip, but more importantly, he has shown that we should not only dream big, but we should act and make those dreams a reality! At the end of our days we must not look back and say “I wish…..” but rather “I did”! I look forward to summit reports of Everest, K2 and Denali! My beautiful Nepal. Thank you DAWN for the beautiful pictures. Nepal has all elements to be one of the best countries in the whole world. With religious harmony, continuing social revolutions, and much-anticipated and deserved economic development, we'll be there. Tourism, electricity, and trade with two economic giants- India and China- That's it! Absolutely stunning pictures. Well done Dawn for this detailed article. I wish I could go there too but the writer took me there with his words and photographs. Top travel article. I'd love to go mountaineering as soon as I can provise for my family.